A single conductivity meter measurement at a point of interest can be used to detect spills or leaks if they can be expected to provide a significant and unusual change in conductivity. Thus, a probe in a plant effluent channel that normally runs at 10,000 umhos could easily detect a rather small amount of HCI-but it might not see acetic acid at all. In situations where the conductivity of the contaminant is smaller than normal steam fluctuations caused by other factors, a differential measurement with a conductivity sensor can be used. One measurement is taken at a point prior to the location of potential leaks or spills- such as the inlet of a heat exchanger. A second is taken downstream from where contaminant is expected to be introduced-in this case, the outlet of the heat exchanger. The readings are then electrically compared. If they rise and fall together, no action is taken. But, should the outlet rise significantly higher than the inlet, it will indicate that tube penetration has occurred and the cooling stream is being contaminated within the exchanger. The conductivity meter can trigger alarms or actuators to alert an operator or shutdown the system automatically. The difficulty in using conductivity to control this reaction of course lies in the fact that, unless you've been watching closely, you don't know which side of neutral you're on at a given time. Despite this drawback, the approach could still be attractive on applications where physical or chemical conditions are too severe to use a PH electrode. In a system with sufficient retention time, grab samples of pH could enable an operator to add the proper reagent (acid or base) to reach the minimum point. Conductivity cells can be easily constructed from a wide variety of materials and built to conform to almost any physical requirement. 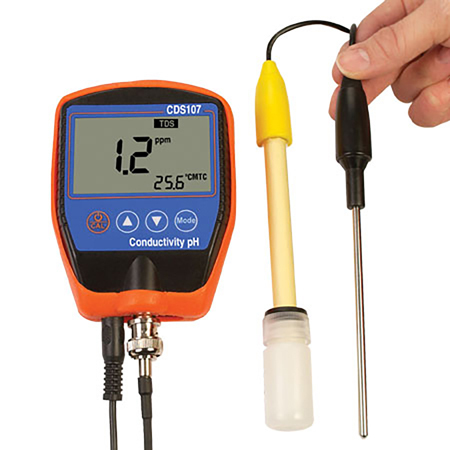 Pressures and temperatures far outside the range of pH equipment can be accommodated- probes with constants of 20.0 have been built for 250 psi, 200�C (400�F) operation.